For those project managers out there, you’ve probably heard of the Critical Path before. Every project plan has a critical path; the longest path of planned activities to logical end points of a project. The activities along the line of the critical path are without slack, or float; meaning that a delay of 1 in these activities, delays the project in its entirety by 1. Clearly, the timeframe here is driven by the time it takes to do the translation, editing and proofing. Not considering any availability issues, professional translators translate about 2,000 words per day and an editor can do up to 5,000 words of editing per day. At full capacity and with 5 working days, that means that the translator probably needs about 3.5 out of 5 days and the editor about 1.5 days based on the capacity and consistent quality requirements. Either you tackle consistency on the front end and have the translator do all the work and have 2 editors review, reducing the editor’s time by half. This does mean that the translator needs to take the lead in the final decision on the edits for consistency and style, which may cause additional delays in case of discrepancies. Or, have two translators work on the translation, with one editor proofing both works for consistency and accuracy, thereby reducing the translator’s time in half. In this case, the editor takes the lead on style and consistency and you lose the final step of proofing by the lead translator. This may also increase the timeframe of the editor a bit, but this process is the most efficient way to reduce time; bringing the timeframe down to 6.75 days as illustrated below. Lower the quality – Machine Translation has come a long way, but it’s not recommended for anything other than information gathering. 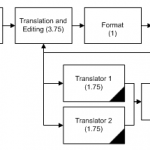 Machine Translation can be an excellent tool to speed up the process of certain materials. Translation is done at an instant, and editing can be done in a timeframe that is very much dependent on the quality needs vs. time needs. Client Linguistic Review is a complex and sometimes psychological process; something that probably should have its own post some day. However, Client Review can be a very helpful process. Client Reviewers should be subject matter experts in their language and can provide insight into company specific terminology that is being used. Besides that, most clients may choose this level of review as another way of making sure that the translation is accurate, but this shouldn’t be the main reason if you select a reputable translation provider (understand what you buy). Now, we have some ambiguity in the process. For one thing, it’s difficult to schedule client reviewers. Often, the client reviewers are assigned outside of their normal job duties. Also, we don’t know how well qualified client reviewers are in following guidelines, their ability to apply proper grammar and spelling rules to their changes and their overall behavior towards the amount of changes they want to make. So we have ambiguity in the time it takes to get the client review back plus the quality of the changes that we get back. Unless the client wants us to accept what the client reviewer writes, our translation team proofs the changes for both spelling and grammar, accuracy and also to protect the English message (protect your brand). Per this process, the timeframe is set at 13 working days. Note that the time to find availability, schedule the client reviewer and come to an agreement on the approach can be a maximum of 6 working days before the client reviewer starts. The ability for the client to identify, qualify and inform the client reviewer on the process becomes a crucial part to the overall timeframe of this process. Plan ahead – If you know you will be communicating in foreign languages, you may already be in contact with the local offices to get information about their processes. Include the conversation of Client Linguistic Review and qualify and appoint someone who is able to take time for the review. Eliminate or reduce the need for client review – One thing in our basic process that we have not addressed is preflight. Especially with client review, it’s important to engage on terminology early on. Our preflight process is usually part of the preparation process and depends on input from the client subject-matter experts. When it comes to long-term projects, eliminating the need for client review should be a main objective, with metrics to control the progress of improvement. These are just a two examples how we deal with changes to the timeframe. While we understand that there may be deadlines looming, learning from deadline issues can help to plan your next translation project more efficiently, save costs and allow you to get the quality you need.